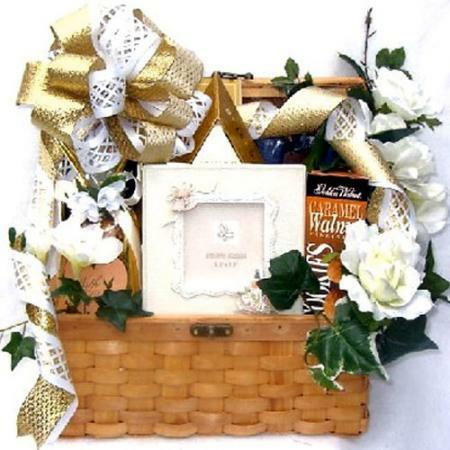 Convey your best wedding wishes with elegance and the most beautiful wedding gift basket you can give the newlyweds. Perfect for weddings and bridal showers. This very elegant wedding gift arrangement features a handmade wicker chest filled with a treasure trove of golden gifts and gourmet goodies for the happy couple. an absolutely stunning wedding frame! Trimmed with silk white roses, ivy and a designer bow, they are sure to cherish this wonderful gift. Perfect for anniversary, bridal shower gift or wedding day presentation.